Ever wondered what the world activity, "Falador Party Room", is about? It's an interesting little place, it is, and is available to both F2P and P2P! The Party Room, which has been relocated to Falador from Seers' Village, is a terrific place to hold all sorts of parties and gatherings. Whether a birthday, holiday, or just a random party, the Falador Party Room is the perfect place to go to. You have all sorts of amenities in there, drop parties, kegs of beer, and dancing 'til the night ends. For more great party ideas, check out the Ultimate Party Guide. 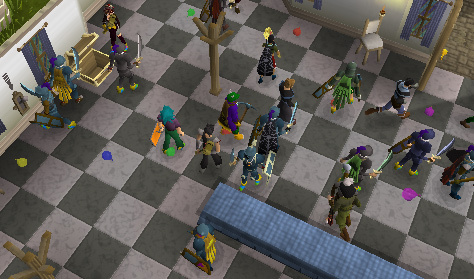 If you're hosting a party, you must hold your party on world 102 (for Freeplayers) or 103 (for Members). 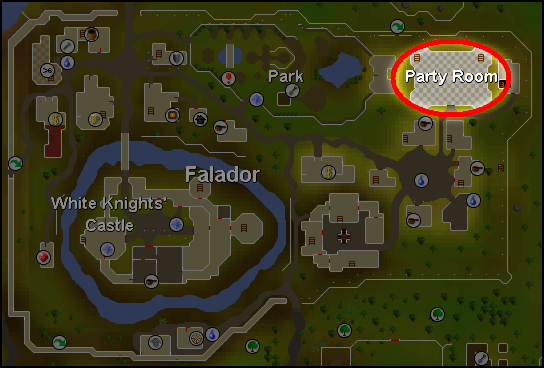 The Party Room is located in the north-eastern corner of Falador, just next to Falador Park. It is relatively large, and all you need to do to get there is follow the northern path of Falador eastwards. Continue along until you reach the courtyard on the east side of the Falador East Bank. At the courtyard you should turn north, and the Falador Party Room should appear. Practically all of the luxuries of the Party Room are found on the main floor. The main floor is a large open space with a dining table in the middle. In the west you have a fireplace, and in the east you have a lever that allows you to view some of the amenities that the Party Room has. If you pull the lever, you will see that there are two options. The two options are, Balloon Bonanza and Nightly Dance. If you select the option for Balloon Bonanza, you will be able to place RuneScape items into the treasure chest next to the lever. Be careful, though, of the items that you put into the treasure chest as you will not be able to get them back! Before you can throw a party here, you must have a Bank PIN set. 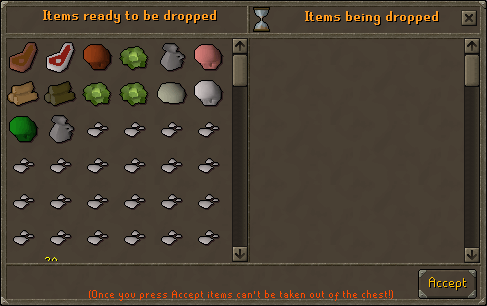 Anyways, the items in the treasure chest will soon be put into balloons that will drop from the ceiling. When the balloons reach the floor, you can pop them and see if there are any of the goods inside the balloons. If you think about it, it's really a drop party! Furthermore, Balloon Bonanza is a 'global' event. Why? Because the market price value of the items in the treasure chest add up, and the cumulative sum of the items in the treasure chest will determine the publicity of the Balloon Bonanza option. Basically, bankers and certain people of RuneScape will announce that there is a Balloon Bonanza event being held in the Party Room. A value of up to 50k: There is a 10 second delay before the balloons drop. 50k - 150k: There is a 1 minute delay before the balloons drop. The Falador bankers and Party Room barmaids will announce that a party is happening. 150k - 1 million: There is a 5 minute delay before the balloons drop. The Falador men and women, bankers and Party Room barmaids will announce that a party is happening. 1 million+ : There is a 10 minute delay before the balloons drop. The Falador men and women, guards, bankers and Party Room barmaids will announce that a party is happening. Nearly all the bankers across RuneScape will also announce that a party is happening, and will offer free teleports to the Party Room. If you find your screen being filled with words, no fear! It's just the bankers of RuneScape announcing that there is a drop party! If you're looking for some comical humor, and looking for some NPC's to embarrass themselves, take a look at Nightly Dance. 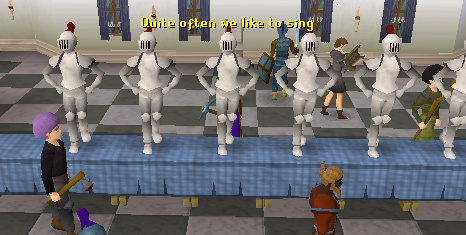 Watch as a group of Falador Knights take stage on the dining table and start dancing their hearts off. As they dance, they will start saying some random statements that are hilarious! Upstairs, you will find a bar. Lucy and Megan are your bartenders, and they will be glad to get you a keg of beer for just 2 GP. In addition, you can take a look at the bottom floor of the Falador Party Room as there is an open area in the middle of the second floor. Of course, you can only take a look at the bottom floor through the second floor if you are on high detail. He's your extravagant, ludicrous partier that owns the Falador Party Room! 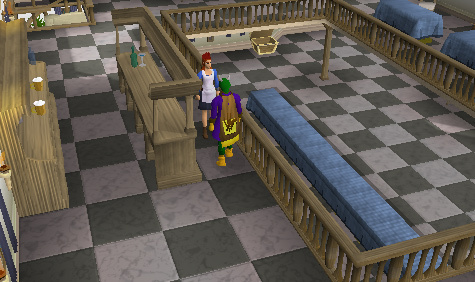 One of the Falador Party Room barmaids. She'll be glad to serve you a keg of beer! Another Falador Party Room barmaid. Be sure to ask her for some beer!